The grade 9 science class worked with microscopes. 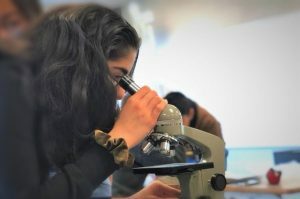 After learning about the structure of a cell, they took swabs of their own cheek cells and observed them under a microscope. The students drew diagrams of the cells and observed many characteristics of the cells, such as the effects of the visible bacterium and the size of the cells.